When our Technical Director flew around the perimeter of Stirling a few months ago he had no idea of the consequent number of ideas it would give us for posting on our blog. This is no less than the 5th article his piloting has inspired! The truth is that in Stirling and its surrounding area there are many varied features in the landscape - from icons of Scottish history such as the Wallace Monument, Stirling Castle and the battlefield at Stirling Bridge to more utilitarian features such as factories, prisons and even a motorway. Another important feature of the landscape is water and in this video clip filmed on Andy's flight water is much in evidence including the Forth and Clyde Canal. 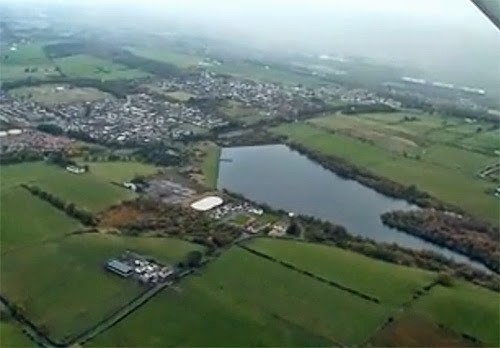 The screen grab below shows the Denny Reservoir coming into view. Water is without doubt one of the most important commodities in life yet so many people take it for granted. The statistics for access to water in terms of global population are sobering and will be a shock to many people. Close to 1 billion people on this planet do not have access to clean and safe water and around 50% of all hospital beds in the world are occupied by people with a water-related illness. To read more about the current global water shortage click here. Most people in Britain, just as with all developed countries, take it for granted that they should have access to clean and safe water. One of the factors which is a great contributor to that safety is the security aspect of water utilities. Service reservoirs and water pumping stations can be targets for theft and damage so it is vital that they have good, reliable protection. Our Electro-Fence ™ system is ideal for this kind of application and has proven itself to be a product of choice for many water utilities in Britain. It has been successfully installed to protect water operations at many sites in recent years including facilities for Thames Water in London, Yorkshire Water in the north of England and Scottish Water. Read more about this type of use for our security products. For us we cannot pass by a reservoir without thinking of the importance of keeping water safe and how truly lucky we are to have clean water readily available - literally on tap.